Elisabeth Vigée Le Brun (1755–1842) is one of the finest 18th-century French painters and among the most important of all women artists. An autodidact with exceptional skills as a portraitist, she achieved success in France and Europe during one of the most eventful, turbulent periods in European history. In 1776, she married the leading art dealer in Paris; his profession at first kept her from being accepted into the prestigious Académie Royale de Peinture et de Sculpture. Nevertheless, through the intervention of Marie Antoinette, she was admitted at the age of 28 in 1783, becoming one of only four women members. Obliged to flee France in 1789 because of her association with the queen, she travelled to Italy, where in 1790 she was elected to membership in the Accademia di San Luca, Rome. Independently, she worked in Florence, Naples, Vienna, St. Petersburg, and Berlin before returning to France, taking sittings from, among others, members of the royal families of Naples, Russia, and Prussia. 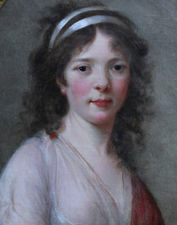 While in exile, she exhibited at the Paris Salons. She was remarkable not only for her technical gifts but for her understanding of and sympathy with her sitters.